Davon's Watch (also known as Darnim Watch) is a settlement on the mainland of Morrowind, along the southern coastline of the Inner Sea. It was once a major port city in the Stonefalls region, controlled by House Indoril. Davon's Watch was sacked by a Nord raiding party led by Thane Unnvald Ironhand in the mid-Second Era, before the signing of the Ebonheart Pact. In 2E 582, the city was put under siege by the invading Daggerfall Covenant. 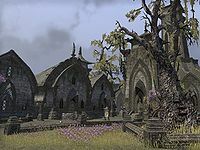 Despite the advice of his ancestors, Grandmaster Tanval Indoril released the ancient Daedra Balreth, originally a Chimer general, who had been imprisoned in Ash Mountain for centuries. Balreth destroyed the Covenant forces utterly, freeing Davon's Watch, and was subsequently rebound by the Pact. The Worm Cult also had a brief presence in the city. By the time of the Imperial Simulacrum in the late-Third Era, the village of Darnim Watch was no longer a significant settlement. It was ruled by Lord Ulfar and it had a rivalry with Helnim Wall and Old Run. This page was last modified on 4 February 2019, at 01:36.